I’ve had a pretty eye opening week with the education system and I have to say, that I am massively encouraged by what I have been seeing. It started with the fabulous book ‘The Element’ by my hero Ken Robinson, lent to me by my mate Leanna the very clever General Manager and ex teacher from BeWILDerwood. I’ve written about Sir Ken before and loved his TED Lectures., so I guess I was on the look out for particularly creative elements in education. As I said previously, my kids are both at Rushcliffe School in Nottingham, which is a good state school that prides itself on its results, but also uses the theory that every child should be allowed to shine in any subject. What I love about this is that it means there is life beyond maths, english and a few science subjects. Teaching young people to pass exams, does not enable them to enter the world of work. I was there this week for some presentations and not only saw some amazing musical performances by the pupils, but a headteacher Phil Crompton, stand up and openly say he disagrees with the idea of an English baccalaureate as it will restrict young people from being able to excel in drama, music and other areas that encourage their creativity. At last. 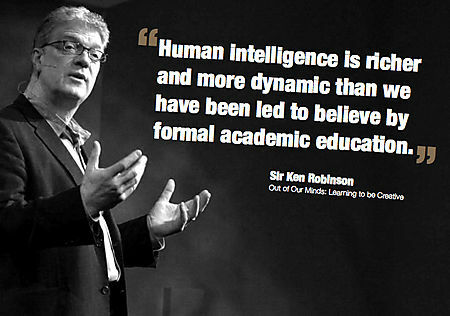 Ken Robinson’s thinking is getting through. Thank you Mr Crompton and your team, my children are in good hands. And then on Thursday, I went for lunch at Antenna in Nottingham with the brilliant Craig Chettle. I just love the place. It’s a hive of creativity and is giving young people the chance to learn how to produce, manage and make music and TV. It is like a gigantic sweet shop for a geek like me with technology and creatives all jammed into such a inspiring space. Antenna is part of the Confetti Media Group that Craig runs and has TV production, music studios and a really powerful educational element to it that I would love my kids to think could be part of their future. It just doesn’t feel like an exam based place, but feels like kids will naturally shine if they have it in them to take the opportunity. They are both places that Nottingham should be incredibly proud of. Maybe some other cities should come to us and have a look. Reading back over this post, it sounds like a press release sponsored by Ken Robinson, Rushcliffe and Antenna, but it’s not. It’s genuinely not. I had a pretty seriously low opinion of the way education was going and between these three events, my opinion has changed. I was lucky enough to be at a lunch the other day too, where some senior Labour politicians came and listened to our opinions of what we thought they should do in order to get things back on track. Unsurprisingly, I said that I thought they had to invest in education and educational infrastructure. It would be money well spent and help build the future of the country by allowing more creative and open minded people to enter work and not be afraid of making mistakes on the way. Maybe, just maybe, this is starting to happen. 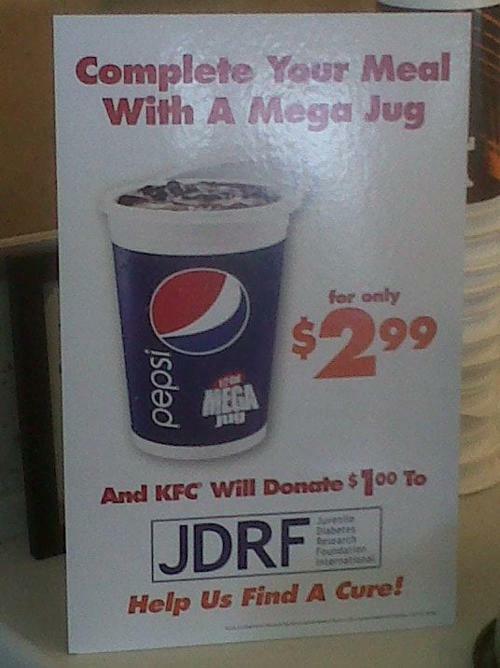 KFC in the US are vowing to help Juvenile Diabetes Research Foundation (JDRF) by donating a full dollar to the charity when someone buys one of their $2.99 half-gallon drinks. Wow, that’s really generous isn’t it? A third of the sale price goes to charity. Each of these half-gallon drinks contains over 800 calories. Calories as we know, are a major contributor to obesity in any age group and in children in the US it’s a real and growing problem. Brands like to hang out with other brands as there is generally a values overlay. Both do well from each other. But to try and link to a health related charity with a drink that contains 56 spoonfuls of sugar has to be one of the most crass attempts at buying grace for the brand. If I ran the JRDF Charity, I would tell KFC to stick it and milk the hell out of the PR opportunity it created. Thanks to Death and Taxes for the image. You know, the one, where the camp looks terrible, it’s wet and vile. Then the sun comes out and it all looks beautiful again. You know, this one. Well that’s what has happened in Margate. I wrote a piece in August 2009 here. 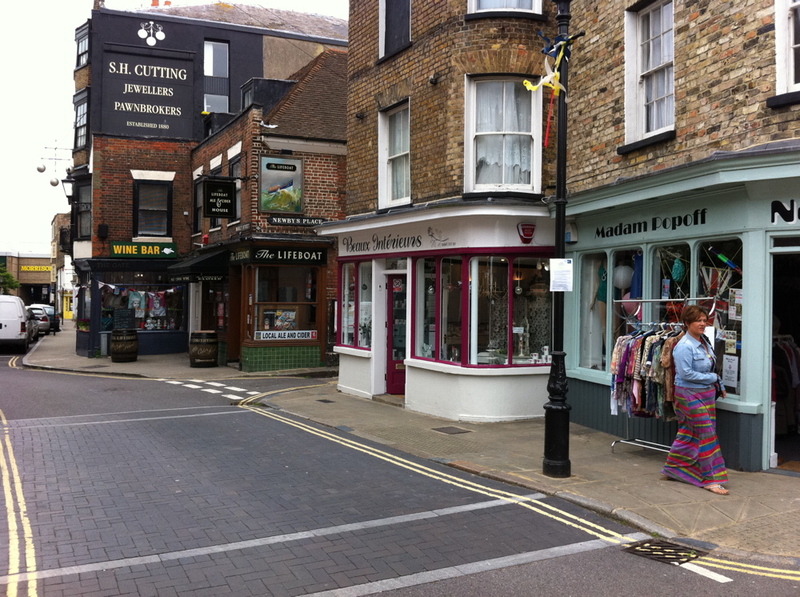 And then later in 2009, I suggested that Margate Councillors should be more creative in the way they attracted retailers here. Well, the alternative was to build a huge great new Turner Contemporary instead. Which they did. And what a difference it has made. It’s like the clouds have cleared and the games have started. The Old Town, which had potential, has delivered. A little market was a start point, but the retail space is lovely. And whilst this picture doesn’t do it justice, the cafes are bustling on a Sunday morning and people are landing to see the Turner and spreading out through the town. Margate looked lovely for the first time in years. It looks a little loved, as though the money spent on it has finally been well spent. The future for Margate has to be more than pie and mash and jellied eels, it has to have some culture in it too. Hopefully the Turner and it’s crowd of visitors can deliver this too. 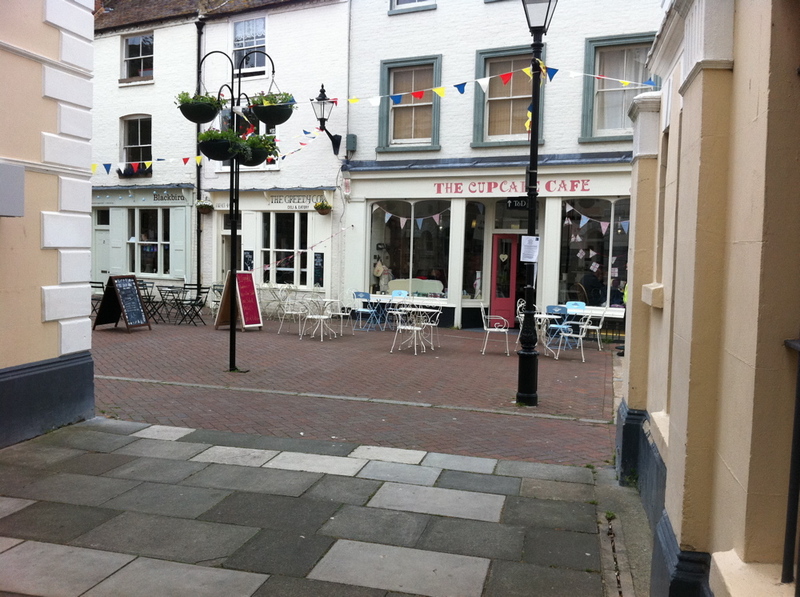 I just hope the growth continues back into the rest of the town too…. Not since the jokey Volvo commercials where they said ‘Volvo, they’re boxy but good’ in the film Crazy People, has anyone ever been quite so honest with their promotional material. And it just gets funnier and funnier as you read on. I’m almost tempted to try it out. Almost.